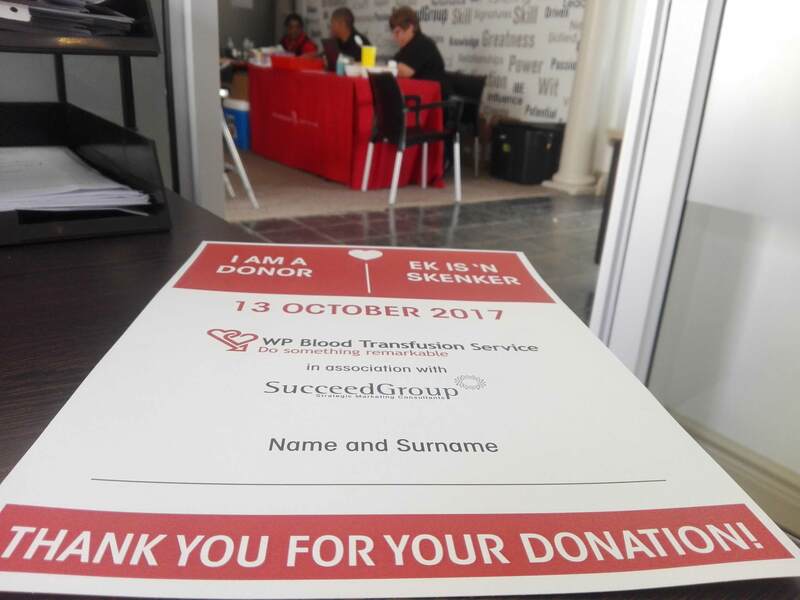 On 13 October 2017, independent organisation, WP Blood Transfusion Service made their way to the SucceedGroup canteen, known to the staff at Succeed as the SucceedCafé, for their blood drive. 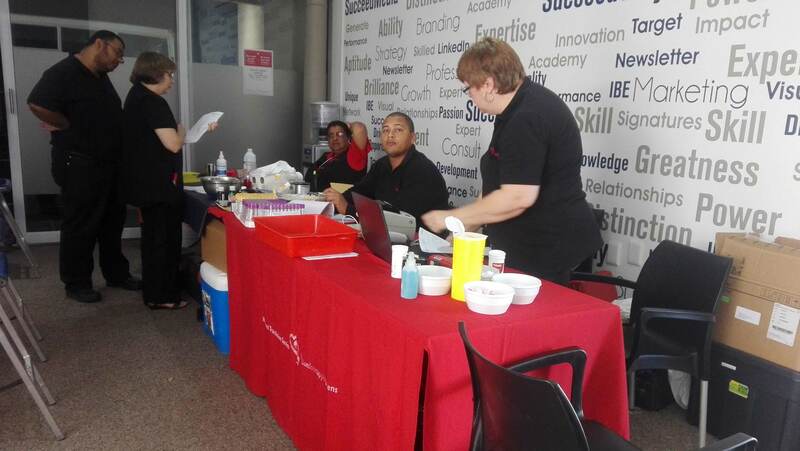 As devoted Samaritans, SucceedGroup hosted the blood drive, inviting their staff members, clients and the public to donate blood between 10am and 3pm. 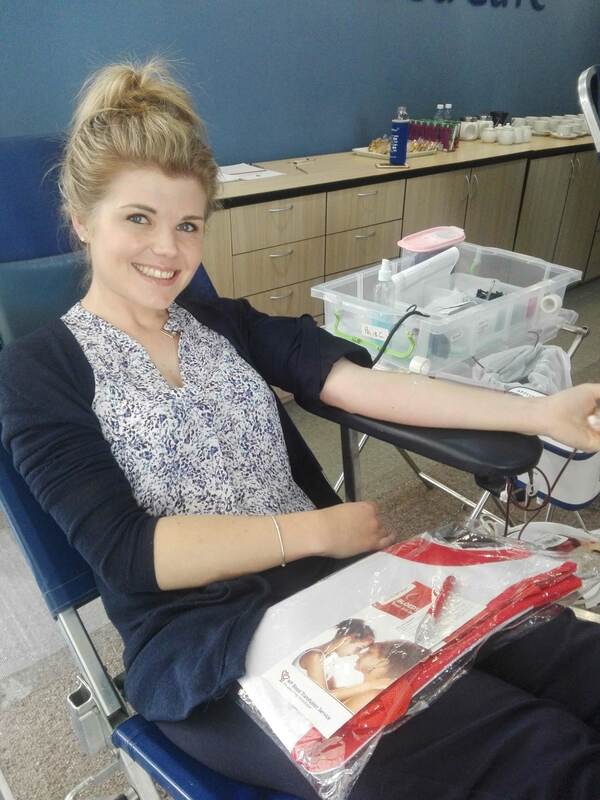 With less than 1% of South Africans being active blood donors, the call for regular donations should be heeded. In addition to the nine Succeed staff members who donated, employees from Primi Piatti and shops at the Sanctuary mall across the street took time out of their day to join in the cause. Some donors facing their fears by donating for the first time, a total of 23,5 (0,5 from a first-time donor) units were collected. Each unit can save up to three lives, and WP Blood Transfusion Service collects more than 165 000 units a year. Before a person can donate, they have to be older than 16 years, and weigh more than 50 kilograms. The active donation process begins with the donor filling out a questionnaire about their lifestyle, medication requirements and general health. “This is so we are able to determine if the donor is taking any medication that could be dangerous to the transfusion patient,” explained professional nurse, Daleen Joshua. The donor then takes a test to screen their iron levels. Should these levels reflect between 12,5 and 20 for females, and, 13,5 to 20 for males, the donor may proceed with donating their blood. Following the active donation, the units are transported to the WP Blood Transfusion Service laboratory in Pinelands for testing. This process helps with determining the blood types of each donation. There are eight main blood type groups; A+, O+, B+, AB+ (these are Rh positive), and A-, O-, B-, AB- (these are Rh negative). 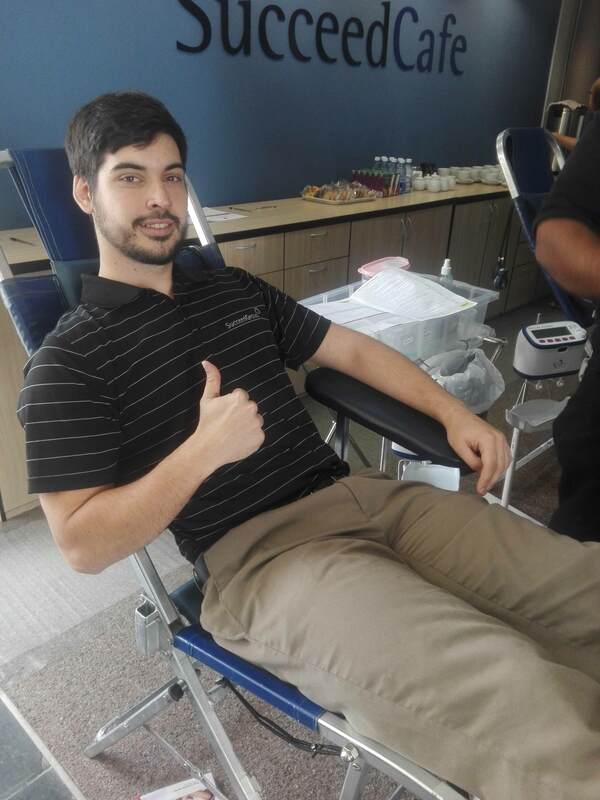 “The rarest blood type is AB- and the most common is O-,” said Joshua. It is imperative that the donated blood is then transfused to a recipient of the same blood type – mixing blood types leads to clumping. From the laboratory, the units are sent out to hospitals, where the transfusions are administered. Donors younger than 65 years can donate six times a year, and for donors older than 65 years, four times a year. SucceedGroup is proud to have been involved with this initiative. Aiming to impact the community positively through active participation, SucceedGroup continuously seeks opportunities to better the Helderberg community. For any questions or information about SucceedFoundation, please feel free to contact Ben vd Westhuyzen at ben@succeedgroup.co.za. 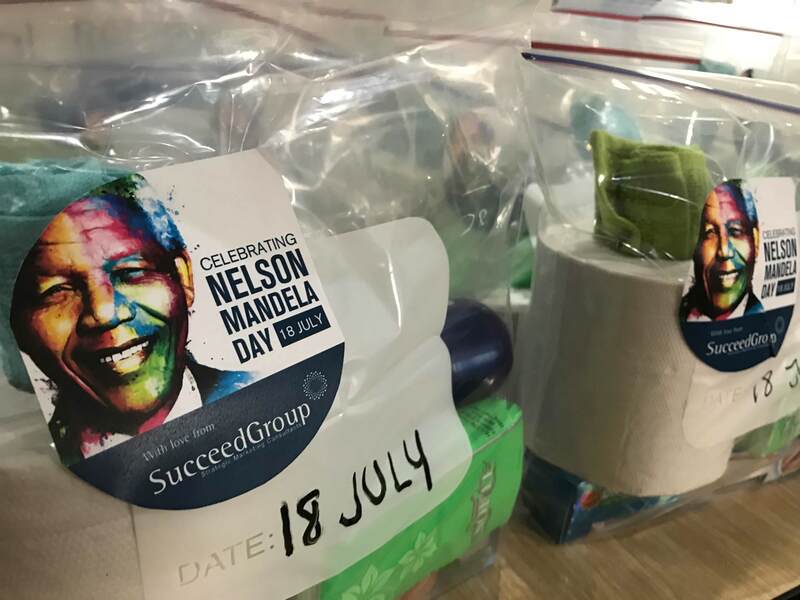 On 18 July 2017, SucceedGroup set out to impact more lives for Mandela Day’s 67 minutes. Visits made, parcels given, gardens reworked, but most importantly, time dedicated. 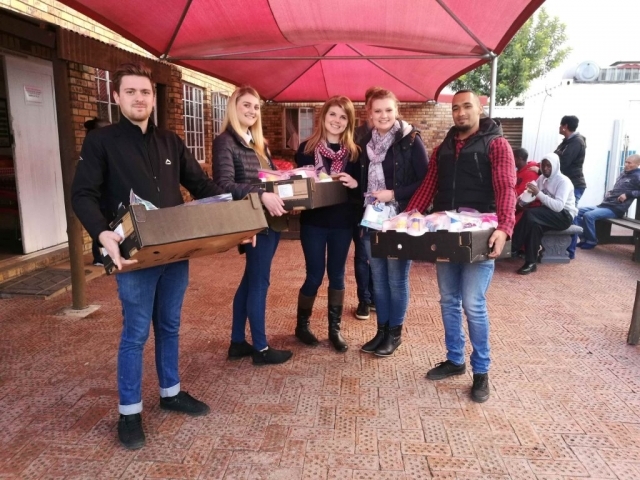 SucceedGroup’s first stop was the Somerset West Night Shelter to gift each individual a prepacked parcel of hygiene essentials, before pursuing the Helderberg Hospice to refurbish their Garden of Remembrance. The Shelter, established in 1988, serves as a temporary home for the rehabilitation of homeless adults towards re-integration into society. 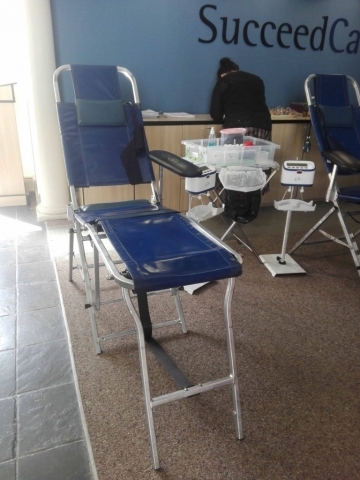 In achieving this, these individuals are given the opportunity to seek counselling, assisted with identity document applications and social grant applications, and informed through HIV awareness programs. SucceedGroup toured the Shelter’s premises, inclusive of their snug vintage clothing shop, and cosy coffee shop, Church Street Coffee, which runs specials and cakes of the day. The idea of the coffee shop serves to welcome the public, while informing them about the Shelter. Profits from both shops, which were built just a year ago, go towards the Shelter. 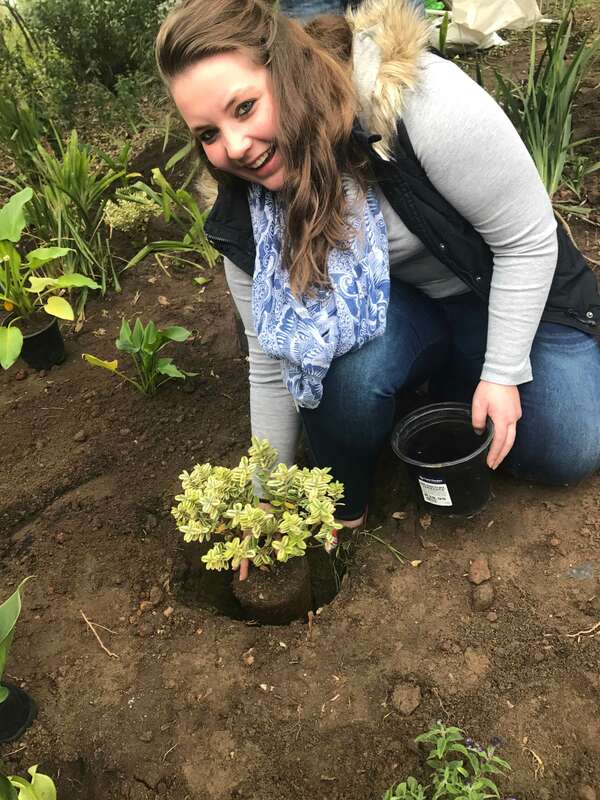 The Shelter accommodates up to 42 males and 12 females, increasing these numbers during their annual Winter Campaign by transforming their skills rooms into extra dormitories. 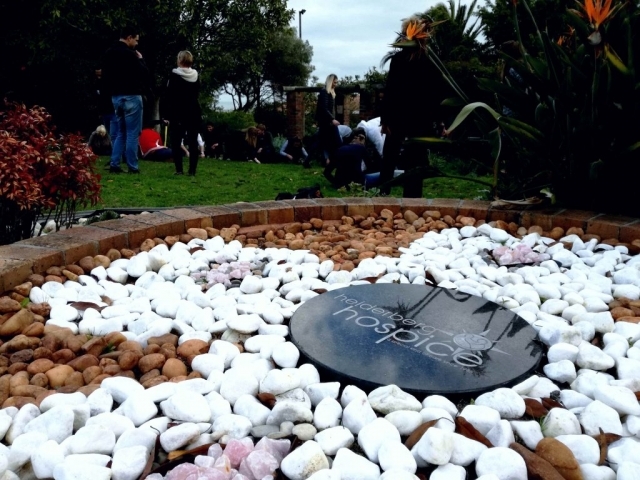 Helderberg Hospice, a non-profit palliative care facility, was established in 1986 to provide compassionate care and assistance to individuals facing the end stages of life-threatening illnesses. The Hospice’s in-patient unit, equipped with 10 beds and licenced by the Department of Health, offers around the clock nursing for symptom management, pain management, and terminal care for up to two weeks, while the Hospice liaises with each patient’s doctor. skills rooms into extra dormitories. 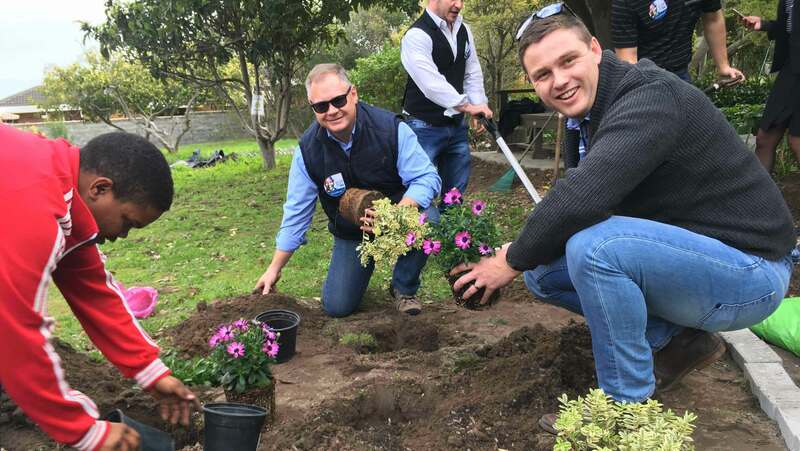 Volunteers maintain and donate plants to the lush Garden of Remembrance, which, as one of the Hospice’s anniversary projects, is open to the public, from Monday to Friday 08h00 to 16h30. Patients of the Hospice’s in-patient unit can access the large gardened grounds under flexible hours to accommodate their respected privacy. The Hospice, which operates through volunteering staff members and healthcare professionals, and assistance from the public, has been accredited as a 5-star facility by COHSASA. 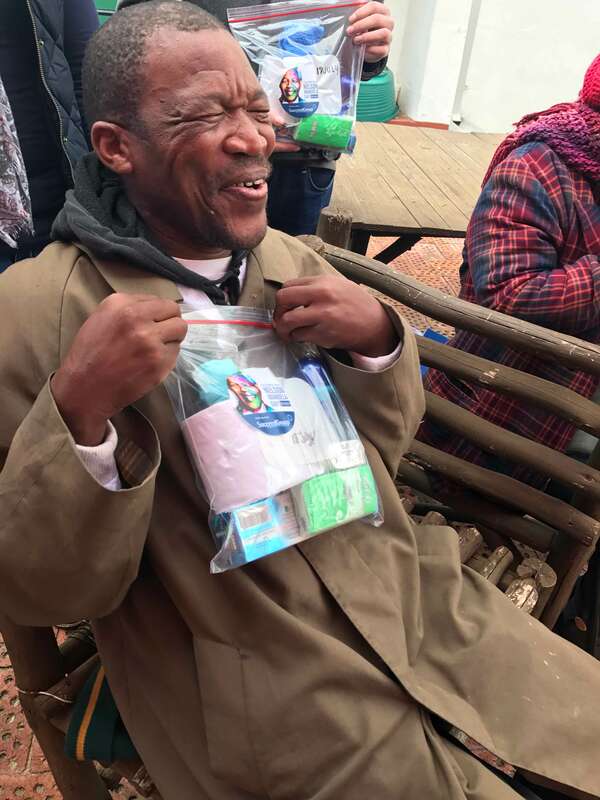 Realising the importance and liveliness each of these organisations serve, SucceedGroup is fulfilled to have been able to perform these small, yet necessary acts of kindness. 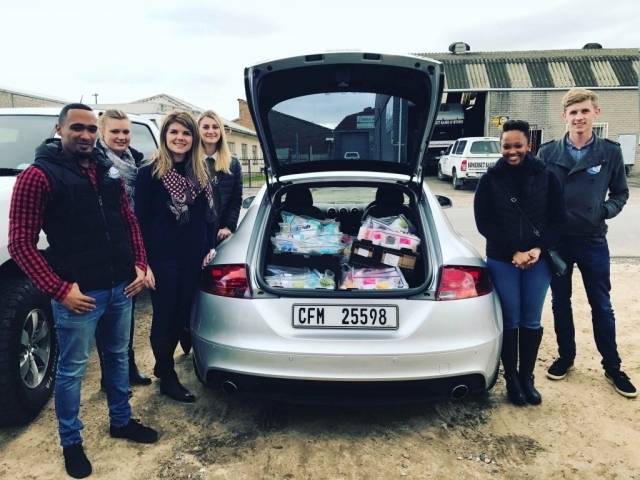 As a selfless marketing consultancy, SucceedGroup strives to make a big dent in the community’s drawbacks, and continues to contribute to the betterment of the Helderberg area. Usually, when you launch a business, you funnel your resources and energy into your company – not into helping others. However, SucceedGroup is in its 7th year of existence and the directors have decided that the business have settled into a healthy growth rate and rhythm and the time is right to allocate our time and resources and give back to the community – and so the idea of SucceedFoundation was born at the end of 2014. Being strategic marketing consultants the decision that had to be made was to identify which resources we can offer as a commodity and secondly we had to identify where we can make a difference? It was also important that the project we decide on, will mobilise our staff and our clients in aid of what we are trying to achieve. The high level of unemployment in South Africa makes job creation a crucial challenge. However, job creation without skills development and training does not lend itself to sustainable employment. Training is therefore a crucial element of all social responsibility projects and therefor it was decided that the core offering of SucceedFoundation will be soft skill training. 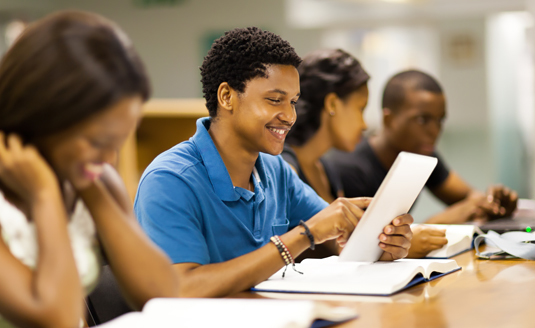 Furthermore the South African economy is moving towards a knowledge based society, resulting in organisations insisting on certain skills requirements in order to remain globally competitive and this is where we can make a difference. SucceedFoundation will provide business related soft skill training for the underprivileged and those who couldn’t and cannot afford to empower themselves with critical basic skills required in the South African workforce environment and change their lives for better. The goal is to successfully overcome the barrier of poverty and low income for themselves and their families. 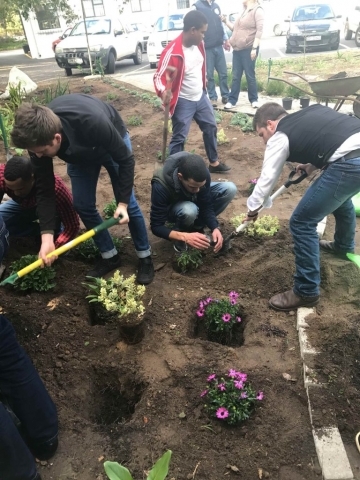 This intervention will target less educated, employed, but low income individuals from disadvantaged communities with critical and needed skills to empower themselves and become more competitive in the working environment. The objective is to provide these handpicked individuals free access to our Full Course range which offers certificates to those who successfully complete the courses and show the critical skills required from each soft skill course. 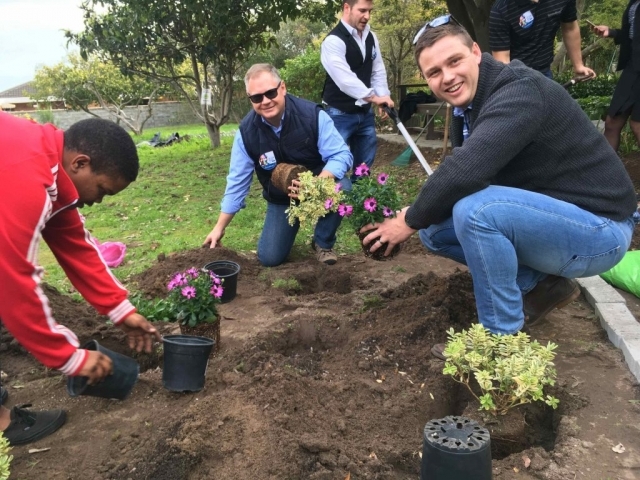 The methodology to be adopted by the project will be that of a practical, hands-on approach at our training venues in our Somerset West and Gauteng (later this year) offices. 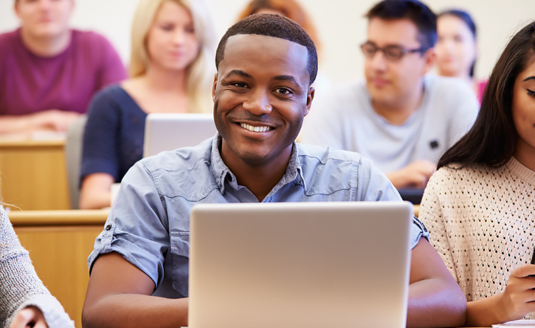 E-learning courses are available to those who have access to computers in the workplace. The individuals who attend the classroom training will be taken through theory sessions by the trainers and be exposed to critical soft skill development scenarios. A vast and popular variety of 72 different full courses are on offer which mainly covers the fields of marketing & selling, management, human resources, computers skills, professional development & general soft skills.